H.E. Khalid Al Falih, Minister of Energy, Industry, and Mineral Resources and Chairman of Saudi Aramco, said in a keynote speech: “iktva represents a pioneering and model program, among other major programs which the Saudi Arabian government is working on to expand and diversify the economy, localize strategic industrial and economic sectors, and create jobs, in alignment with Saudi Vision 2030.” By the end of 2016, IKTVA has been included in over SR60 billion worth of contracts and the IKTVA third party certification baseline for the top 100 suppliers will have been completed. T&M Associates led the 2 year project from 2014-2015 “The Kazakhstan Health Sector Technology Transfer and Institutional Reform Project” on increasing public and private sector capacity in food processing and HACCP. With sustainability at the center of the program, several in-country professionals were developed to provide training and consulting post-project. More than 15 seminars for industry and government were held; detailed instruction manuals and books were developed and distributed; and 7 manufacturers were upgraded to meet international HACCP standards. This project was led by A. Vasylenko supported by T&M Associates staff including: G. Leasenco (EU Food Safety Expert, Moldova), V. Barotova (EU Food Safety Expert, Estonia), and O. Dorofieieva (Food Processing expert, Ukraine). Saudi Aramco announced its In Kingdom Total Value Addition (IKTVA) program on December 1, 2015. This program is designed to establish the economic foot print and contribution that suppliers make to the kingdom that will be used to double the local content to 70% by 2021 on an annual spend of $33 billion US. The program has targeted creation of 500,000 new Saudi jobs and increase exports by 30%. The program was designed and developed based on T&M Associates’ work in Azerbaijan. More Information can be found at this link. 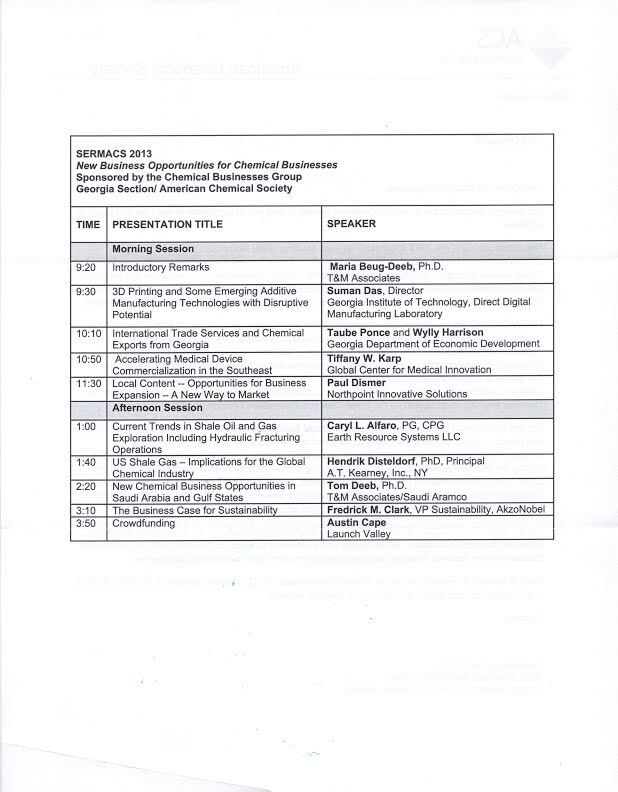 The Chemical Business Group of the Georgia Section/American Chemical Society hosted 2015 ACS President Diane Grob Schmidt to meet with industry leaders in the area. The Chemical Businesses (CHB) Group was started as a self-sustaining committee of the Georgia Section by Dr. Maria Beug-Deeb and Deanna Hall. The CHB Group provides a forum for the more than 300 chemical businesses within the Georgia Section and fosters business development through networking. More information can be found at this link. T&M Associates’ US Patent 20140275267 A1 on “Methods and compositions for cleaning and disinfecting surfaces” is filed in March 2014. This is one of the few inventions that delivers a 5-log kill for a range of bacteria in biofilms. The technology has a broad range of applications in healthcare, agriculture, and food processing. T&M Associates partnered with Development Alternatives, Inc., from March 2011 to 2016, on the Agricultural Competitiveness and Enterprise Development Project (ACED) to improve the competitiveness of Moldovan high value agriculture (HVA) by addressing binding constraints in targeted fruit and vegetable value chains at the marketing, production and policy levels. Complementing Millennium Challenge Corporation (MCC) investments in irrigation system rehabilitation, ACED provides the critical market development and technical assistance support needed by beneficiaries as they transition to irrigated HVA production. T&M Associates led a million dollar development program to upgrade the state phytosanitary service to compliance with international norms which allowed the exports of HVA to EU and Russian Federation.